These highlights do not include all the information needed to use INDOCIN® SUPPOSITORIES (INDOMETHACIN SUPPOSITORIES) safely and effectively. See full prescribing information for INDOCIN SUPPOSITORIES (INDOMETHACIN SUPPOSITORIES). SUPPOSITORIES: INDOCIN Suppositories are available as 50 mg suppositories for rectal use only. INDOCIN Suppositories are not for oral or intravaginal use. THIS SECTION PREDOMINANTLY MAKES REFERENCE TO INDOMETHACIN CAPSULE, USP ORAL DOSAGE FOR GUIDANCE IN USING SUPPOSITORIES. INDOCIN suppositories 50 mg can be substituted for indomethacin capsules, USP; however, there will be significant differences between the two dosage regimens in indomethacin blood levels [see Clinical Pharmacology (12.3)]. Indomethacin capsules, USP 25 mg twice a day. or three times a day. If this is well tolerated, increase the daily dosage by 25 mg or by 50 mg, if required by continuing symptoms, at weekly intervals until a satisfactory response is obtained or until a total daily dose of 150-200 mg is reached. Doses above this amount generally do not increase the effectiveness of the drug. Indomethacin capsules, USP 75-150 mg daily in 3 or 4 divided doses. Indomethacin capsules, USP 50 mg three times a day. Until pain is tolerable. The dose should then be rapidly reduced to complete cessation of the drug. Definite relief of pain has been reported within 2 to 4 hours. Tenderness and heat usually subside in 24 to 36 hours and swelling gradually disappears in 3 to 5 days. INDOCIN Suppositories: 50 mg of indomethacin. White and opaque. Observational studies conducted in the Danish National Registry have demonstrated that patients treated with NSAIDs in the post-MI period were at increased risk of reinfarction, CV-related death, and all-cause mortality beginning in the first week of treatment. In this same cohort, the incidence of death in the first year post-MI was 20 per 100 person years in NSAID-treated patients compared to 12 per 100 person years in non-NSAID exposed patients. Although the absolute rate of death declined somewhat after the first year post-MI, the increased relative risk of death in NSAID users persisted over at least the next four years of follow-up. Avoid the use of INDOCIN in patients with a recent MI unless the benefits are expected to outweigh the risk of recurrent CV thrombotic events. If INDOCIN is used in patients with a recent MI, monitor patients for signs of cardiac ischemia. In a gastroscopic study in 45 healthy subjects, the number of gastric mucosal abnormalities was significantly higher in the group receiving indomethacin capsules than in the group taking INDOCIN Suppositories or placebo. In a double-blind comparative clinical study involving 175 patients with rheumatoid arthritis, however, the incidence of upper gastrointestinal adverse effects with INDOCIN Suppositories or indomethacin capsules was comparable. The incidence of lower gastrointestinal adverse effects was greater in the suppository group. The adverse reactions reported with indomethacin capsules may occur with use of the suppositories. In addition, rectal irritation and tenesmus have been reported in patients who have received the suppositories. Monitor patients with concomitant use of INDOCIN with anticoagulants (e.g., warfarin), antiplatelet agents (e.g., aspirin), selective serotonin reuptake inhibitors (SSRIs), and serotonin norepinephrine reuptake inhibitors (SNRIs) for signs of bleeding [see Warnings and Precautions (5.11)]. Concomitant use of INDOCIN and analgesic doses of aspirin is not generally recommended because of the increased risk of bleeding [see Warnings and Precautions (5.11)]. During concomitant use of INDOCIN and ACE inhibitors, ARBs, or beta blockers, monitor blood pressure to ensure that the desired blood pressure is obtained. It has been reported that the addition of triamterene to a maintenance schedule of INDOCIN resulted in reversible acute renal failure in two of four healthy volunteers. INDOCIN and triamterene should not be administered together. Indomethacin and triamterene should not be administered together. During concomitant use of INDOCIN with diuretics, observe patients for signs of worsening renal function, in addition to assuring diuretic efficacy including antihypertensive effects. Be aware that indomethacin and potassium-sparing diuretics may both be associated with increased serum potassium levels [see Warnings and Precautions (5.6) ]. The concomitant use of indomethacin with digoxin has been reported to increase the serum concentration and prolong the half-life of digoxin. During concomitant use of INDOCIN and digoxin, monitor serum digoxin levels. During concomitant use of INDOCIN and lithium, monitor patients for signs of lithium toxicity. During concomitant use of INDOCIN and methotrexate, monitor patients for methotrexate toxicity. Concomitant use of INDOCIN and cyclosporine may increase cyclosporine's nephrotoxicity. During concomitant use of INDOCIN and cyclosporine, monitor patients for signs of worsening renal function. Concomitant use of indomethacin with other NSAIDs or salicylates (e.g., diflunisal, salsalate) increases the risk of GI toxicity, with little or no increase in efficacy [see Warnings and Precautions (5.2)]. Combined use with diflunisal may be particularly hazardous because diflunisal causes significantly higher plasma levels of indomethacin [see Clinical Pharmacology (12.3)]. In some patients, combined use of indomethacin and diflunisal has been associated with fatal gastrointestinal hemorrhage. The concomitant use of indomethacin with other NSAIDs or salicylates, especially diflunisal, is not recommended. Concomitant use of INDOCIN and pemetrexed may increase the risk of pemetrexed-associated myelosuppression, renal, and GI toxicity (see the pemetrexed prescribing information). During concomitant use of INDOCIN and pemetrexed, in patients with renal impairment whose creatinine clearance ranges from 45 to 79 mL/min, monitor for myelosuppression, renal and GI toxicity. When indomethacin is given to patients receiving probenecid, the plasma levels of indomethacin are likely to be increased. During the concomitant use of INDOCIN and probenecid, a lower total daily dosage of indomethacin may produce a satisfactory therapeutic effect. When increases in the dose of indomethacin are made, they should be made carefully and in small increments. INDOCIN reduces basal plasma renin activity (PRA), as well as those elevations of PRA induced by furosemide administration, or salt or volume depletion. These facts should be considered when evaluating plasma renin activity in hypertensive patients. False-negative results in the dexamethasone suppression test (DST) in patients being treated with indomethacin have been reported. Thus, results of the DST should be interpreted with caution in these patients. There are no adequate and well-controlled studies of INDOCIN in pregnant women. Data from observational studies regarding potential embryofetal risks of NSAID use in women in the first or second trimesters of pregnancy are inconclusive. In the general U.S. population, all clinically recognized pregnancies, regardless of drug exposure, have a background rate of 2-4% for major malformations, and 15-20% for pregnancy loss. In animal reproduction studies retarded fetal ossification was observed with administration of indomethacin to mice and rats during organogenesis at doses 0.1 and 0.2 times, respectively, the maximum recommended human dose (MRHD, 200 mg). In published studies in pregnant mice, indomethacin produced maternal toxicity and death, increased fetal resorptions, and fetal malformations at 0.1 times the MRHD. When rat and mice dams were dosed during the last three days of gestation, indomethacin produced neuronal necrosis in the offspring at 0.1 and 0.05 times the MRHD, respectively [seeData]. Based on animal data, prostaglandins have been shown to have an important role in endometrial vascular permeability, blastocyst implantation, and decidualization. In animal studies, administration of prostaglandin synthesis inhibitors such as indomethacin, resulted in increased pre- and post-implantation loss. Reproductive studies were conducted in mice and rats at dosages of 0.5, 1.0, 2.0, and 4.0 mg/kg/day. Except for retarded fetal ossification at 4 mg/kg/day (0.1 times [mice] and 0.2 times [rats] the MRHD on a mg/m2 basis, respectively) considered secondary to the decreased average fetal weights, no increase in fetal malformations was observed as compared with control groups. Other studies in mice reported in the literature using higher doses (5 to 15 mg/kg/day, 0.1 to 0.4 times MRHD on a mg/m2 basis) have described maternal toxicity and death, increased fetal resorptions, and fetal malformations. Comparable studies in rodents using high doses of aspirin have shown similar maternal and fetal effects. In one study, levels of indomethacin in breast milk were below the sensitivity of the assay (<20 mcg/L) in 11 of 15 women using doses ranging from 75 mg orally to 300 mg rectally daily (0.94 to 4.29 mg/kg daily) in the postpartum period. Based on these levels, the average concentration present in breast milk was estimated to be 0.27% of the maternal weight- adjusted dose. In another study indomethacin levels were measured in breast milk of eight postpartum women using doses of 75 mg daily and the results were used to calculate an estimated infant daily dose. The estimated infant dose of indomethacin from breast milk was less than 30 mcg/day or 4.5 mcg/kg/day assuming breast milk intake of 150 mL/kg/day. This is 0.5% of the maternal weight-adjusted dosage or about 3% of the neonatal dose for treatment of patent ductus arteriosus. For additional information about overdosage treatment contact a poison control center (1-­800-222-1222). INDOCIN Suppositories are a nonsteroidal anti-inflammatory drug, available as a suppository containing 50 mg of indomethacin administered for rectal use. The chemical name is 1-(4-chlorobenzoyl)-5-methoxy-2-methyl-1H-indole-3-acetic acid. The molecular weight is 357.8. 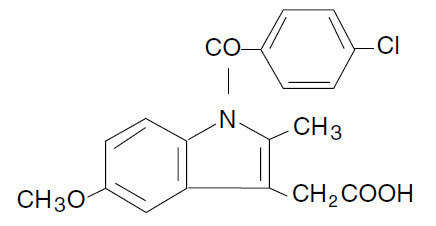 Its molecular formula is C19H16ClNO4, and it has the following chemical structure. Indomethacin is a white to yellow crystalline powder. It is practically insoluble in water and sparingly soluble in alcohol. It has a pKa of 4.5 and is stable in neutral or slightly acidic media and decomposes in strong alkali. The inactive ingredients in INDOCIN Suppositories include: butylated hydroxyanisole, butylated hydroxytoluene, edetic acid, glycerin, polyethylene glycol 3350, polyethylene glycol 8000, purified water and sodium chloride. INDOCIN Suppositories, 50 mg each, are white, opaque, rectal suppositories. Following single oral doses of indomethacin capsules 25 mg or 50 mg, indomethacin is readily absorbed, attaining peak plasma concentrations of about 1 and 2 mcg/mL, respectively, at about 2 hours. Orally administered indomethacin capsules are virtually 100% bioavailable, with 90% of the dose absorbed within 4 hours. With a typical therapeutic regimen of 25 or 50 mg three times a day, the steady-state plasma concentrations of indomethacin are an average 1.4 times those following the first dose. The rate of absorption is more rapid from the rectal suppository than from indomethacin capsules. Ordinarily, therefore, the total amount absorbed from the suppository would be expected to be at least equivalent to the capsule. In controlled clinical trials, however, the amount of indomethacin absorbed was found to be somewhat less (80-90%) than that absorbed from indomethacin capsules. This is probably because some subjects did not retain the material from the suppository for the one hour necessary to assure complete absorption. Since the suppository dissolves rather quickly rather than melting slowly, it is seldom recovered in recognizable form if the patient retains the suppository for more than a few minutes. INDOCIN has been shown to be an effective anti-inflammatory agent, appropriate for long- term use in rheumatoid arthritis, ankylosing spondylitis, and osteoarthritis. 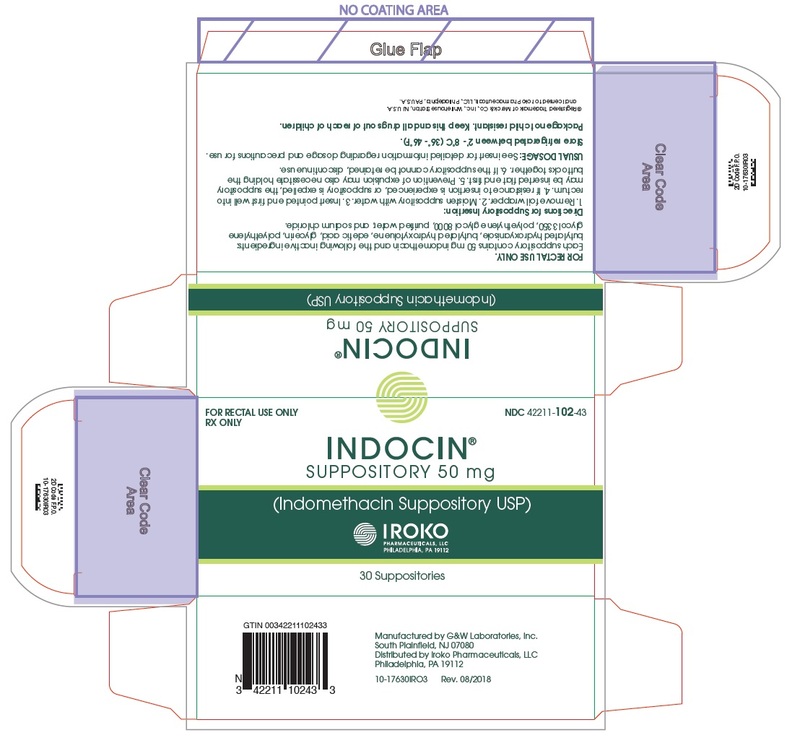 INDOCIN® Suppositories (Indomethacin Suppositories USP), 50 mg each, are white, opaque, rectal suppositories and supplied in boxes of 30 (NDC 42211-102-43). Store refrigerated between 2°- 8°C (36°- 46°F). Advise the patient to read the FDA-approved patient labeling (Medication Guide) that accompanies each prescription dispensed. Inform patients, families, or their caregivers of the following information before initiating therapy with INDOCIN and periodically during the course of ongoing therapy. INDOCIN Suppositories are for rectal use only. Advise patients not to use INDOCIN Suppositories orally or intra-vaginally. • are pregnant or plan to become pregnant. Talk to your healthcare provider if you are considering taking NSAIDs during pregnancy. • Some NSAIDs are sold in lower doses without a prescription (over-the-counter). Talk to your healthcare provider before using over-the-counter NSAIDs for more than 10 days.